Hourly Rate: $60. Half Day Rate: $250. Full Day Rate: $400. Fully air conditioned training room available. Capacity 24 people. Available Mon - Fri from 8 am - 5.30pm. Available Saturday from 8am - 4pm. Melbourne CBD. Close to public transport. 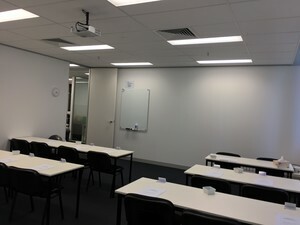 Whiteboards and data projectors are provided in all rooms. The option to connect your Presenter’s laptop to our projector can easily be arranged. All training rooms use EFM (20/20) internet connections, ensuring consistent high-speed internet access throughout your training day. 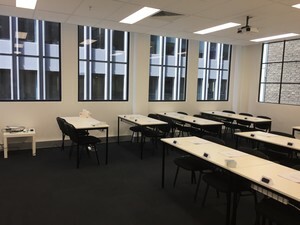 Room Layout Capacity Guide: U-Shape - 18 Boardroom - 22 Cabaret - 20 Classroom - 24 REFRESHMENTS & LUNCH OPTIONS Tea, coffee and water is provided free of charge. We can provide catering if requested subject to charges per head.